Welcome to the World of Cockades! Want to hear them? I write up a cockade story every week and email it to my subscribers. (Psst, I also include occasional coupon codes too!) Sign up by clicking the button. Need a quick reference on a certain topic? Click the buttons on the sidebar for more info! Cockade, n. from the French cocarde. An ornament, such as a rosette or knot of ribbon, usually worn as a badge of identification. People have used ribbon rosettes for centuries to tell their stories. Colors, shapes, and emblems were used to show patriotism, support the troops, stand for a cause, show rank or declare your loyalty. Early on, the colors of the cockade were the colors of the house, dynasty or national flag under which you served. 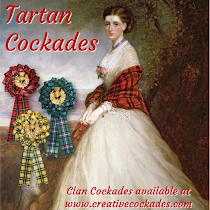 As time went on, cockades were also used to support a cause or party. 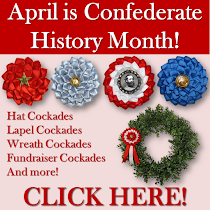 Emblems such as military buttons, ribbon braid, or national symbols were often added to the rosette to create a cockade full of political fervor. Cockades were the political lapel pins of yesteryear. For more history and photos about cockades, click the links at the top of the page. Want to buy a cockade? Check out my shops or contact me directly for a custom order.